Okay, I've been very happy and proud of myself for designing, and writing, my very first pattern. 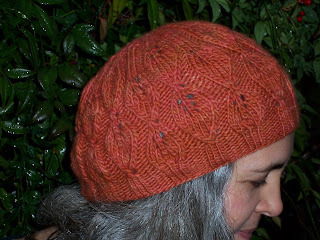 And I've been enjoying some wonderful feedback about the Falling Leaves Hat. But guess what? First pattern = First Errata! I have directly edited the blog post that includes the pattern, and I will add the errata to the pattern page on Ravelry. I hope I haven't inconvenienced anyone. (This 2nd photo is a more accurate as far as color goes. 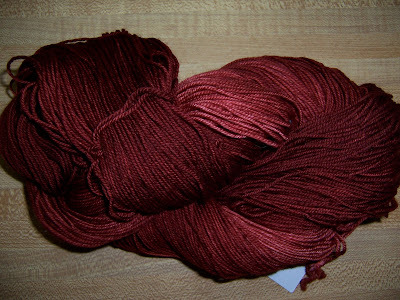 This is Malabrigo worsted in "Garnet". I like this one a little better even though there was not a huge difference in gauge. The stitch gauge actually measures the same, but row gauge was slightly smaller. 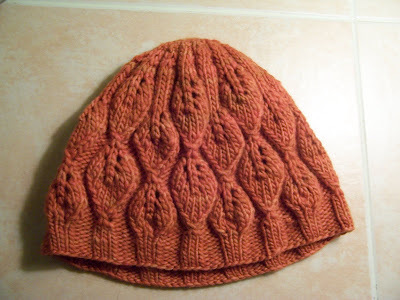 So, if you decide to knit this one I recommend that you check your gauge, and decide for yourself if you want it a little more fitted, or a little slouchier. I have now heard back from everyone who participated in my drawing, so I'm off to the post office! #1. The Malabrigo Sock yarn goes to Amy. #2. The Malabrigo Worsted goes to Kate. #3. The Malabrigo Chunky goes to ikkinlala. If you see your name on the list, please email me with your mailing address. I will send off your Malabrigo asap! I wanted to have something to share with everyone who dropped in and left me a comment, so I finished up a leafy top-down hat pattern I've been working on. A friend offered to test knit this for me, but she hasn't had a chance yet. So if you run into any questions or problems, feel free to email me. I plan on making the pattern available on Ravelry too, but I wanted to post it here first, to give a little back to all of you. Using a crochet hook, CO 8 sts with Emily Ocker’s Circular Beginning (described in Elizabeth Zimmermann’s Knitter’s Almanac), or another circular cast on method. Transfer the 8 sts to 3 DPN’s, tighten loop by pulling on yarn tail. Place marker for the beginning of the row. Row 4: *K1, P1, repeat from * to end of row. Row 6: *K2, P1, repeat from * to end. Row 8: *K2, P2, repeat from * to end. Row 10: *K3, P2, repeat from * to end. Row 12 & 13: *K3, P3, repeat from * to end. Row 15: *K5, P3, K3, P3. Row 17: *K7, P3, K3, P3. Row 19: *K9, P3, K3, P3. Row 20: *SSK, K5, K2tog, P3, K1, YO, K1, YO, K1, P3. Row 21: *K7, P3, K5, P3. Row 22: *SSK, K3, K2tog, P3, K2, YO, K1, YO, K2, P3. Row 23: *K5, P3, K7, P3. Row 24: *SSK, K1, K2tog, P3, K3, YO, K1, YO, K3, P3. Row 25: *K3, P3, K9, P3. Row 27: *K1, P3, K7, P3. Row 28: *M1R, K1, M1L, P3, SSK, K3, K2tog, P3. Row 29: *K3, P3, K5, P3. Row 30: *K1, YO, K1, YO, K1, P3, SSK, K1, K2tog, P3. Row 31: *K5, P3, K3, P3. Row 32: *K2, YO, K1, YO, K2, P3, Slp1, K2tog, PSSO, P3. Row 33: *K7, P3, K1, P3. Row 35: *K9, P3, K3, P3. 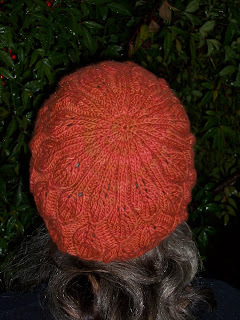 Now change to Size 5 circular needles for edge of hat. Row 45: *K3, P3, K3, P3, repeat from * to end. This last row establishes a 3x3 rib pattern. Continue 3x3 ribbing for 1 inch. 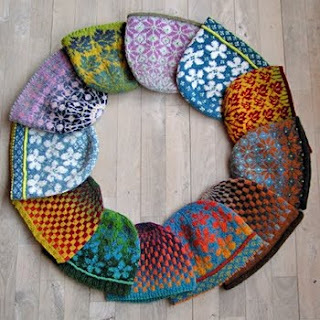 BO loosely and in pattern. Cut yarn, and weave in ends. I hope you enjoy the pattern. If you do knit one up for yourself, I would love to hear about it! I must be addicted. 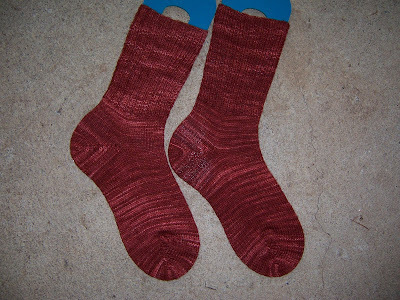 I finished up my Sunday Swing socks a couple of nights ago, and then wore them, as I immediately cast on for the next pair of socks. There is something about finishing socks that still gives me an "I made that!" feeling. Maybe it's because you start with such small needles and yarn but end up with something so functional. Maybe it's because they seem challenging but are actually quite doable. Hats and scarves, while enjoyable, seem pretty routine now. And with sweaters, for me at least, there is such a long interval between deciding what to knit, and actually wearing it that I end up feeling more happy just to be finished. I know you other knitters out there understand what my husband never will: The never-ending cycle of "I just want to be done.... so I can hurry up and start the next project!" 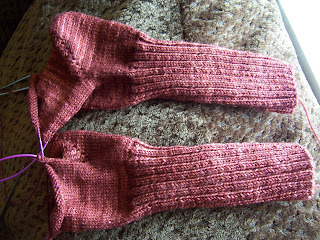 Besides, the next pair of socks are an overdue birthday gift so I really do need to get going on them. My modifications: I added about 1 inch of lace to the neckline instead of the 2 rows of garter stitch called for in the pattern. This sweater represents a couple of firsts for me. This was the first time I completely unraveled a finished project, and reused the yarn for an entirely different pattern. 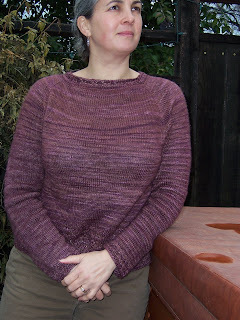 I'm much happier with the Silky Merino now than I was after finishing the T-Shirt Sweater. 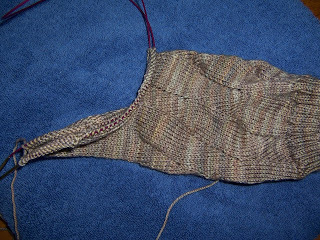 Secondly, I'm finally learning to trust the gauge swatch process. I used to "knit to fit", even when I knew the gauge would relax with washing. This time I finished knitting something that was too small at first, which then fit after it was washed. I have great admiration for Cecily Glowik MacDonald. This pattern was well written and fits incredibly well for a top-down pattern. I would love to knit another of her designs, and there are plenty to choose from among the 8 pages of designs you will find if you look her up on Ravelry. My favorite of the moment is her "Indigo Banded Cardigan", which graced the cover of the Fall 2009 Knitscene magazine. I also love Malabrigo Silky Merino, despite the color pooling issues I ran into. You can see some dark stripes among the subtler areas of variegation in my sweater. If you care about that kind of thing, I would just recommend alternating skeins every couple of rows. 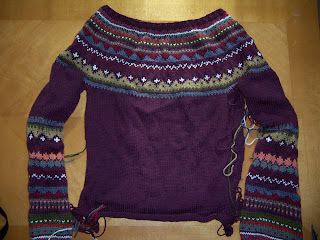 I was too lazy to do that, and I did have to rip out and reknit a couple of areas to be satisfied. It was worth it. The silky merino is super soft, and light, yet warm. 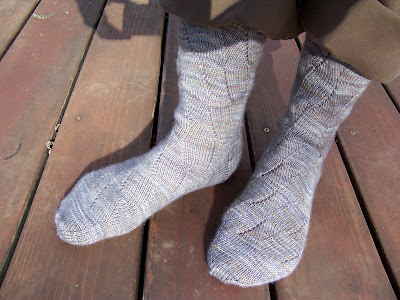 I'm off to try and finish my Sunday Swing socks. Happy Knitting to you in 2010!